If you owe back taxes to the IRS, chances are the IRS has issued a federal tax lien against you. An IRS tax lien can ruin your credit score and prevent you from buying, selling, or refinancing property. If you owe back taxes, there are things that you can do to prevent an IRS lien from being issued, or get an IRS lien release against an existing lien. The easiest way to deal with a lien is to avoid one in the first place. If you have the ability, pay off the tax in full. This will not only avoid the issuance of a lien, but will also substantially reduce the amount of interest and penalties that you would otherwise pay on the tax debt. If you owe the IRS less than $50,000, you can request a Direct Debit Installment Agreement. This agreement requires you to allow the IRS to debit your monthly payments directly from your bank account. So long as the terms of the agreement are met, the IRS should not issue any new liens on the current tax balances. If you have a lien prior to establishing this installment agreement, the IRS grant a lien release once the balance is paid under $25,000 and a series of successful payments have been made. The IRS may discharge a specific piece of property from a tax lien. If you are looking to sell a piece of property that a lien has attached to, you need to request that the IRS first discharge the lien from the property in order to pass clear title to the purchaser. Generally, you must show that it is in the best interest of the government to release the property from the lien. One example would be if the sale will result in proceeds that can then be used to pay the back taxes. A federal tax lien may prevent you from refinancing a piece of property. Not only does it hurt your credit score, it also creates a situation where the lending party (bank) would no longer be the first party to get paid if they refinance. Generally, when you owe a mortgage and taxes, the bank would either get the house or the money from the sale if they were to foreclose. The IRS would then get paid any excess. However, if the bank were to refinance, the IRS would now get paid before the bank, causing the bank to deny a refinance request. However, through a subordination, the IRS allows the bank to still be first, making them more likely to grant the refinance. An IRS tax lien is generally released within 30 days of paying your tax debt in full. A copy of the lien release should be sent to both you and the county in which it was originally recorded. 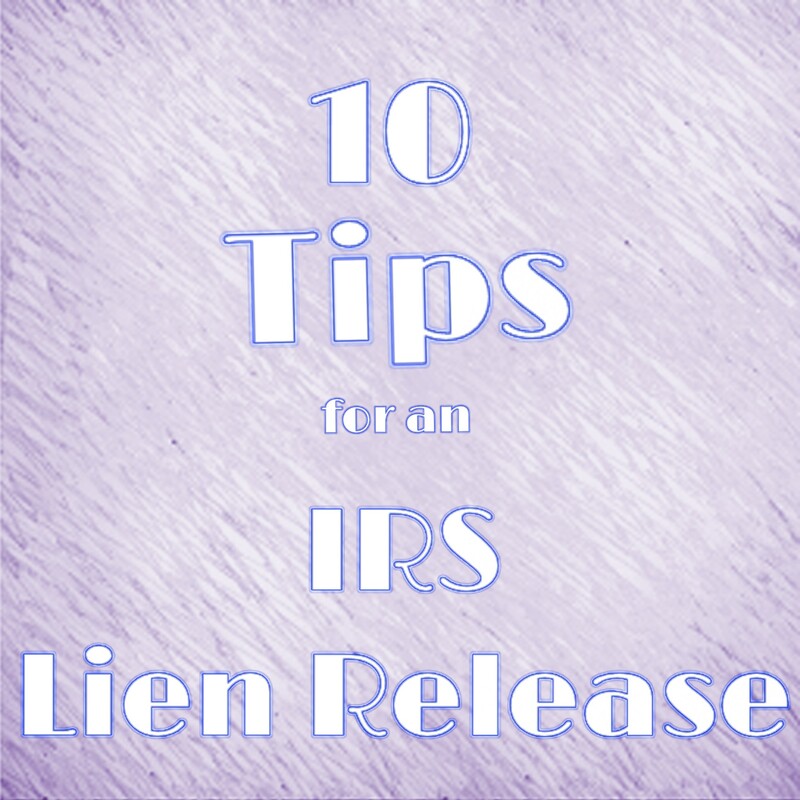 If you do not receive a lien release, you can contact the IRS at (800)913-6050 to request a new copy. An IRS Offer in Compromise will also cause the release of a federal tax lien. Once an Offer in Compromise has been accepted by the IRS and the payment terms have been met, the IRS will release the federal tax liens for any periods included in the Offer in Compromise. This release is generally done within 60-90 days of the IRS receiving the final Offer payment amount. IRS tax liens are tax year specific. A lien may be issued for each individual tax year or one lien may cover multiple tax years and balances owed. The face of the lien should list out both the years and tax balances covered by the lien. If new balances are accrued at a later date, additional liens may be issued. IRS liens are not adjusted for payments made to the underlying balance. Therefore, a lien that was originally issued on a $50,000 balance will continue to show $50,000, even if the current amount outstanding has been paid down to $5,000. Once a federal tax lien has been received by the county, it will generally be forwarded on to the credit bureau. A federal tax lien can greatly reduce your credit score. This lien can remain on your credit for ten years or more. Once it is released, the county should send a copy of the release to the credit bureaus, however, this is not always done. Once you receive your lien release, check your credit reports to make sure that the liens are properly adjusted. An IRS tax lien attaches to all real property you own when the lien is issued along with all real property acquired while it is active. A lien is county specific. Therefore, the IRS may issue multiple liens in multiple county if you have real property, such as a vacation home, in another county. If you want to know if you have any active liens, you can generally call the Register of Deeds in your county and ask them. An IRS tax lien can cause severe damage to your credit and your financial well-being. If you have an IRS lien and need an IRS lien release or if you need help preventing a federal tax lien, contact Austin and Larson Tax Resolution to speak with one of our tax relief specialists.